Your journey to world glory starts here. Build your CV and showcase your talent. The competition will be held annually. 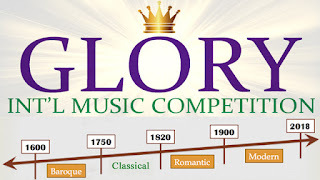 The competitions are open to instrumentalists (piano, violin, viola, cello, double bass, harp, classical guitar, woodwinds, brass & percussion) and singers (art song, classical & Broadway style) of all countries and nationalities worldwide. The competitions are limited to the participation of maximum one hundred (100) contestants. It is allowed to apply for all four competitions but the overall number of contestants can't exceed 100 for the four competitions combined. 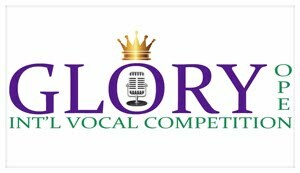 The applications open on August 17 and close on August 31 unless the competition receives applications from 100 contestants before the deadline date. In the latter case, the applications will close earlier than the deadline date. The application process is organized on the "first-come, first-served" basis. * If the contestant is smaller than 7 years old, he/she still can participate by applying for the First Age Group. 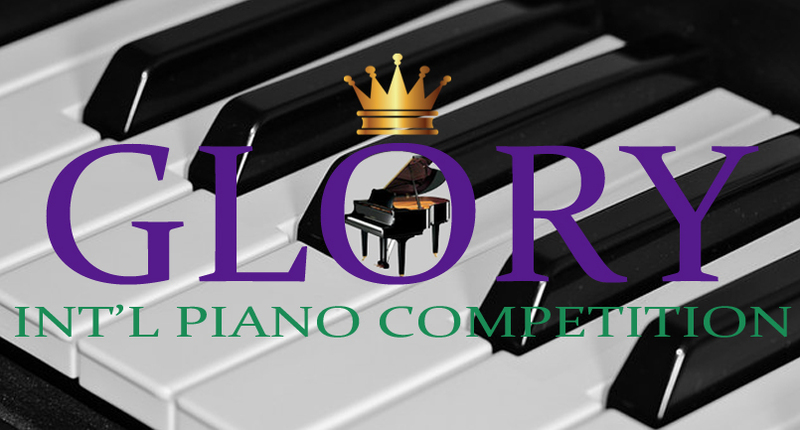 Participants are required to submit online a video recording of their performance. Please submit a link: we accept YouTube links as well as Dropbox, Google Drive etc. The videos should be viewable online. We don't accept download links (videos not available for viewing online). Recordings that are audio only are not acceptable. Video recordings must be genuinely performed by the contestants and may not be edited, nor should any effects be added. To ensure that poor recording quality does not interfere with jury’s ability to review the material, avoid distortion and ensure that accompaniment is not louder than the applicant (where applicable). VIDEO MANAGER → videos → Basic Info → from the drop-down menu, please choose "Public" or "Unlisted" instead of "Private". The performance can be solo, with accompaniment or with orchestra. Transcriptions, adaptations or arrangements are acceptable. 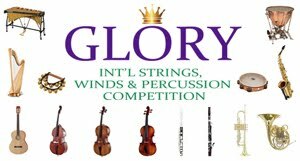 Applicable for instrumentalists only: if your chosen work is a multi-movement piece such as concerto or sonata, please submit only one movement. 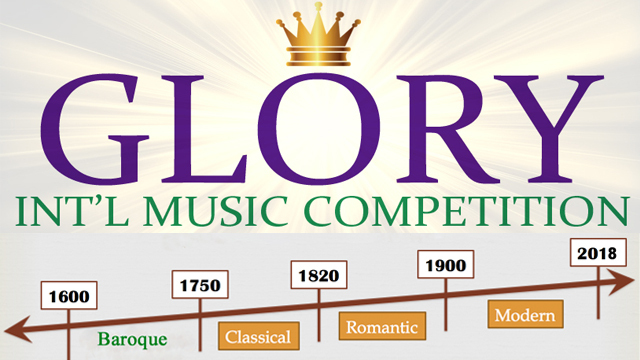 For Glory Int'l Baroque Music Competition please submit a piece from the baroque era in music. Baroque music is a style of Western music composed from approximately 1600 to 1750. For Glory Int'l Classical Music Competition please submit a piece from the classical era in music. Classical music is a style of Western music composed from approximately 1750 to 1820. 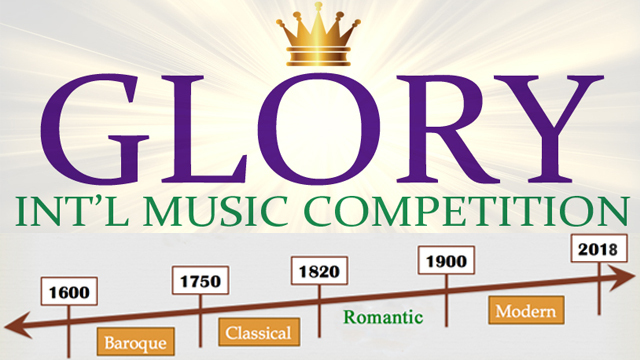 For Glory Int'l Romantic Music Competition please submit a piece from the romantic era in music. Romantic Music is a style of Western music composed from roughly the first decade of the 19th century to the early 20th century. For Glory Int'l Modern & Contemporary Music Competition please submit a piece from 20th century and early 21st century. Modern & Contemporary Music include Impressionist c. 1890–1925, Expressionist c. 1908–1950, Modern c. 1890–1975, Postmodern c. 1930–present, and Contemporary c. 1945–present. The audience vote as well. Every participant will receive the link to the voting page to share with friends, relatives, and the world. Everybody can vote. The teachers of all participants will be invited to join The Professional Jury Board. Those who agree will be able to vote online along with the competition committee, according to the scoring system as explained further below. All participants will be invited to join the Students Jury and vote as well. In addition, the Audience will also have the chance to cast a vote. Their votes will be recorded separately and their choice and preferences will be announced separately from The Professional Jury Board's. The vocal teachers vote for the participants - singers. The same principle as above: pianists vote for pianists etc. There's no restrictions for the Audience. They may vote for all. The ranking for the distribution of the 1st, 2nd, and 3rd Prizes will be computed according to the votes provided by The Professional Jury Board. Each participant will have three type of scores: the first, from The Professional Jury Board; the second, from the Student's Jury; and the third from the Audience. An important part of the judging process is to guarantee there's no conflict of interests, prejudice or underhand stipulations. The Professional Jury Board: judges may not vote for their students because they have a professional teacher-student relationship or both professional and personal affiliation (teacher and parent). In other words, the judges may vote for all participants except for their student(s). The Students Jury: participants may not vote for themselves. The Audience: each person may vote only once. Any cheat attempt may result in a disqualification of the participant who is trying to cheat. In addition to the above, the competition committee will be on the alert for unfair play: suspicious or very unusual votes. For example a person giving the lowest possible points to all participants. In such cases of unfair play those votes will be treated as null and void and won't have any influence upon the final ranking. Certificates will be granted to all members of The Professional Jury Board. The participants have no right to present any objections against the composition or the votes of the Jury. The decision of the Jury and the competition committee is final and can’t be appealed. Multiple awards will be given in each age group and category. The prizes will be awarded based solely on the submitted recordings. The competition committee may award additional accolades. All winners get a dedicated profile web page on the competition's website with a photo and other details included to share with friends and the world. Diplomas for 1st, 2nd and 3rd Prize will be granted to the winners. Audience Awards Certificates will be granted to the winners. Certificates will be granted to The Professional Jury Board members. All First Prize winners get the following award provided courtesy of VirtuosoChannel: an interview to be published on the sponsor's website www.virtuosochannel.com. 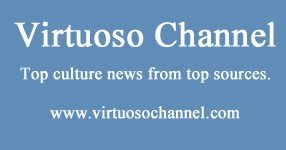 The VirtuosoChannel Grand Prize is not shareable. On its sole discretion, VirtuosoChannel will choose one of the First Prize winners and he/she will be awarded with an Ad Slot (the space on a webpage where an ad loads) on (1) the homepage of VirtuosoChannel's website and (2) on the top of the classical music news feed webpage for the period of one month. The results of will announced on the competition's website on October 1st. Interesting fact: Did you know that October 1st is the date of the annual International Music Day (IMD) initiated in 1975 by Lord Yehudi Menuhin? 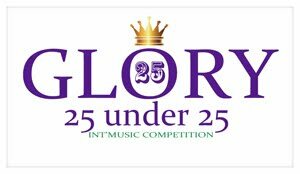 The GLORY Int'l Music Competition Committee reserves the right to make any changes into the rules, dates, schedules and other information related to the Competition. 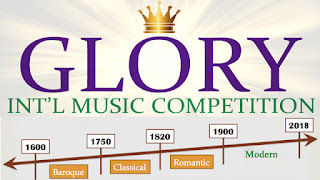 The GLORY Int'l Music Competition reserves the right, in its sole discretion, to disqualify any applicant found to be, including, but not limited to: (a) violating the Competition Rules and Policies; (b) tampering or attempting to tamper with the application process or the operation of the Competition; (c) cheating or attempting to cheat by means of false or manipulated recordings or otherwise; (d) providing false or misleading information before, during the application process, or afterwards; (e) making abusive demands or comments.